Finalist in the Starz Character Idol, a Character Design/Development competition at the 2008 Ottawa International Animation Festival, a major international event. Location: the Fairmont Château Laurier, Ottawa, ON, Canada. A panel of animation industry professionals including some from the entertainment company Starz, chose four contestants from the entries. James was one of the four finalists. He pitched his character Holly and received a honorable mention. Graphic File Format: JPEG. Date: 2008. 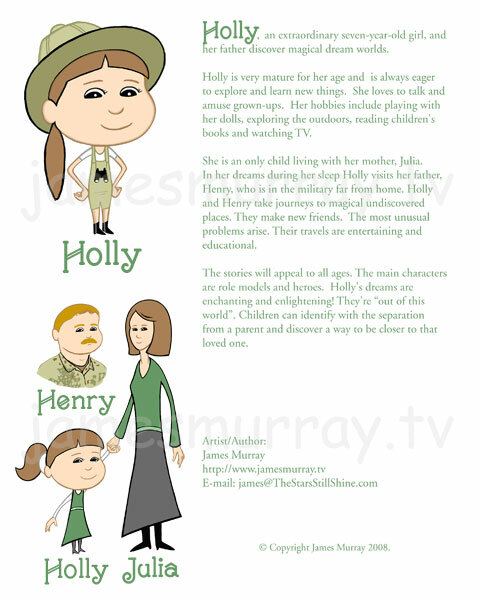 Browsing Samples: Browse other cartoon character designs samples by clicking the Previous link. You may also click on a link in the Portfolio Directory below.